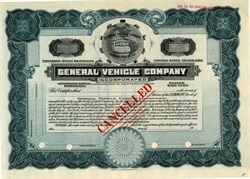 Beautiful engraved RARE specimen certificate from the General Vehicle Company dated in 1913. 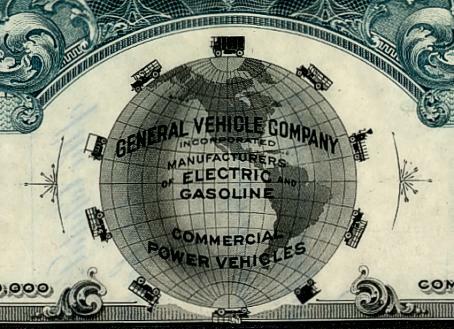 This historic document was printed by Security Bank Note Company and has an ornate border around it with a vignette of a very small odd fashioned trucks circling a small globe with the words "Manufacturers of Electric and Gasoline Commercial Power Vehicles". This item is over 94 years old. Rare, possibly unique. General Vehicle Company of Long Island City operated from 1906 to 1920. The PEERLESS MOTOR CAR CO., noted for its luxury automobiles, was established in Cleveland in 1889 as the Peerless Wringer & Mfg. Co., located on the city's east side at the junction of the Cleveland & Pittsburgh and the New York, Chicago & St. Louis railroads. By 1892 it had become the Peerless Mfg. Co. Originally a producer of washing-machine wringers, Peerless moved to 2654 Lisbon St. in 1895 and began making bicycles in the late 1890s. The company was manufacturing automobiles and parts in 1901 and was renamed the Peerless Motor Car Co. 2 years later. The company's factory was built in 1906 at 9400 Quincy Ave. This 1932 Peerless, with a complete aluminum body and engine, was one of only 3 built by the Peerless Motor Car Co.
Peerless employed Louis P. Mooers in 1902. He designed the first completely original Peerless and began entering his designs in automobile races with some success until he left in 1906. The company was known for its luxurious touring car models, priced at $3,200, $4,000, and $6,000 in 1905. In 1915 Peerless merged with the General Vehicle Co. of New York and the Cleveland concern became a subsidiary of the resulting Peerless Truck & Motor Co. When it became clear in the 1920s that the market for the large touring cars was limited, the company lowered its prices and tried to promote medium-sized cars. Although President James A. Bohannon tried to save the firm, Peerless was unable to survive the Depression and the last Cleveland-based company to build automobiles in the city closed in 1931. After a careful study of the Depression-era market, Bohannon organized the Carling Brewing Co. in 1933 and operated it in the old Peerless factory. This was one of the most important early builders of electric vehicles in America, making many of the sight�seeing 'rubberneck' buses which plied in New York, Washington and other cities. Other products included ambulances, brewery trucks, tipping coal trucks and special vehicles for lifting safes to the upper stories of office buildings, handling' machinery and withdrawing telephone cables from underground conduits. In 1906 the name was changed to General Vehicle Company, and the products to G.V. Known electric vehicle builder (GV Electric) who also built buses and funeral vehicles in the early part of the 20th century. The next Electrical Engineering Society meeting will be held next Friday evening in the Union. The speaker will be Mr. Day Baker, the New England superintendent of the General Vehicle Company. As an appropriate subject for the occasion, Mr. Baker will discuss Electric Vehicles. IN 1914 The French-designed Gnome rotary engine was built under license by the General Vehicle Company in Long Island City, New York, and was used in Cole Palen's first Fokker triplane until a cylinder departed the engine in mid-flight. The US Army purchased a number of Peerless trucks. They were well liked by the Army. When WW1 broke out, England purchased 12,000 Peerless Truck Chassis and used them in the war, suppling the Army's in Europe. Peerless changed the corporate name to Peerless Truck and Motor Car Company in the teens. This was a result of a stock take-over that took place in 1915. The General Vehicle Company from Long Island was involved with this.